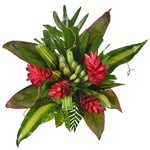 Create a jungle atmosphere at your wedding with Sweet and Sassy Tropical Centerpieces. 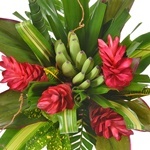 Nine different varieties of tropical greenery make the arrangement feel lush and thick, while vibrant pops of red ginger and unique green banana fingers make for a attractive bouquet. Use this arrangement for simple, but striking bridesmaid bouquets, or for centerpieces at a tropical-themed event.